At a time when political courage on all levels has been replaced by thirty-second sound bites and by polls designed to identify how people would respond to various actions, these nine case studies remind the reader that courageous presidential decisions are necessary, will have important consequences, and could cost the makers their reputations and reelections. 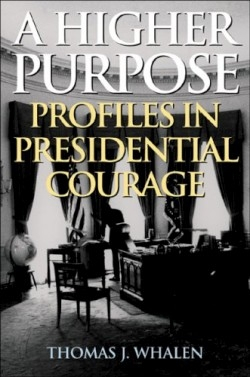 Whalen defines political courage as “that special quality of valor exhibited by certain presidents in times of crisis, placing conscience over expediency, regardless of personal or political cost.” This definition is similar to the one used by John F. Kennedy in Profiles in Courage, the book which inspired Whalen’s account. Whalen, who holds a doctorate in American history from Boston College and is an assistant professor at Boston University, clearly admires John F. Kennedy. His earlier book, Kennedy Versus Lodge: The 1952 Massachusetts Senate Race, examines the election that made Kennedy a national figure, and the author includes an impassioned retelling of Kennedy’s fight to desegregate the University of Alabama as one essay in this book. Each essay is approximately twenty-five pages and includes a useful biographical sketch, as well as a concise, informative analysis of each decision, describing its immediate effect on the president and the long-term impact on the country. Some stories are more familiar: Abraham Lincoln and the Emancipation Proclamation, Theodore Roosevelt as trust regulator, and Harry Truman and the firing of General Douglas MacArthur. Other essays discuss lesser-known controversies, such as Jackson’s successful fight to de-charter the Bank of the United States because it came to favor “the few at the expense of the many.” The victorious Jackson, although comfortably re-elected in 1832, saw the anti-Jackson Whig Party emerge as a force and Jackson became the only sitting president to receive a formal reprimand. In 1881, Vice President Chester A. Arthur, who, as Whalen shows, enjoyed a career as a political hack, became president when James Garfield was assassinated. He angered his former cronies by becoming an advocate of good government, relentlessly lobbying congress for civil service reform, which passed as the 1883 Pendleton Act. Ten years later, in 1893, President Glover Cleveland won a short-lived victory that stopped America from annexing Hawaii. However, in 1898, President McKinley, more enthusiastic about an American empire than Arthur, formally annexed Hawaii, against the will of the Hawaiians. These essays are based on secondary sources and offer little for the scholar. However, for high school students, undergraduates, and general readers, they are an enjoyable and informative recounting of some of American history’s greatest events and of the brave presidential decisions that made them possible.